‘Language is the soul, identity and right for an ethnic race’. Uttering these words, on the 14th of January 2018 (Sunday), the celebration event of the Thai Pongal Festival was inaugurated, at the Robelle Domain Parklands, Springfield. This cultural event was jointly organized by TTS (Thai Tamil school) and QTM (Queensland Tamil Mandram) and was running for its 5th consecutive year. To have celebrated this grand and colourful function on the actual Pongal day (i.e. 1st of Tamil month Thai) itself was a great boon to the event, and that too on the Sunday. The Sunshine State QLD lived up to its name, with the sun shining magnificently, accepting our attempt to thank him for a bountiful harvest. Vayu Baghavan the wind God, also made his presence known with a strong, cool breeze present throughout the day. All in all, the day turned out to be thoroughly enjoyable, reflecting the joy felt among those participating in the festival. The day started with twenty ladies dressed up in traditional saree and cooking PONGAL (A sweet rice porridge) in the morning and offering it to the Sun, thanking him and the whole nature for his great role in providing food for the world through the hard-work of farmers and livestock animals. Hearing about the celebrations, Melbourne office of Australian broadcasting cooperation interviewed us about the pongal function and aired it live on national radio, making us extremely proud of our rich culture. 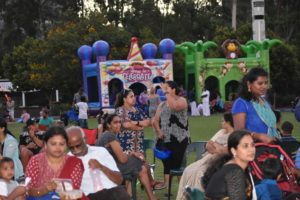 With catchy Tamil songs being played to contribute to the festive atmosphere in the afternoon, many traditional outdoor games were played, with all manner of participants regardless of age or gender, filling us with a wonderful feeling of togetherness. A major highlight was the Kolam competition. 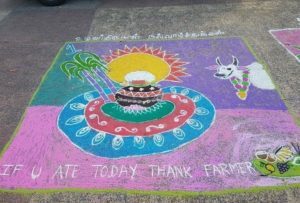 Kolam is a floor art, made with rice flour and used to express various forms of designs and happenings related to Pongal. 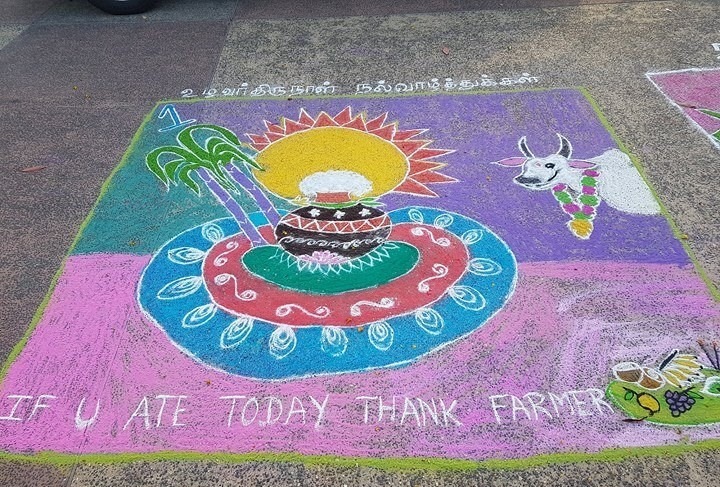 Six colourful Kolams were made, sharing a valuable message to thank farmers for their tireless efforts. Around 5.30 pm, the programs on the stage were inaugurated by the special guests (including the honourable Mayor of Ipswich Andrew Antoniolli, State Member of Jordan, Charis Mullen and Mr and Mrs Umesh Chandra) by lighting the traditional standing oil lamp ’Kuthuvilakku’. Ms. Kavitha from the Fiji Indian community performed a traditional Bharathanatiyam (classical dance) to start the cultural events. It was followed by a melodious Bharathiyar (a famous and influential Tamil poet) song sung by Mrs.Priya Sivakumaran. 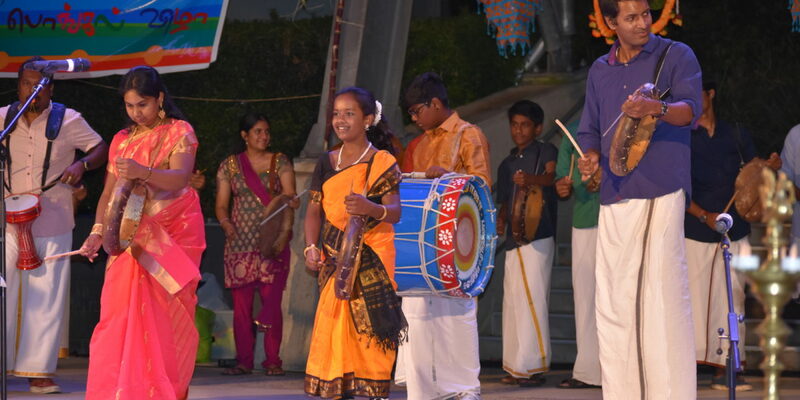 Then came the highlight of the cultural events, the Parai drumming. 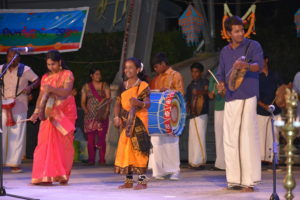 Parai is an ancient form of drumming ingrained within the Tamil culture, and its sounds filled the audience with adrenaline and pumped up all those who witnessed the performance. 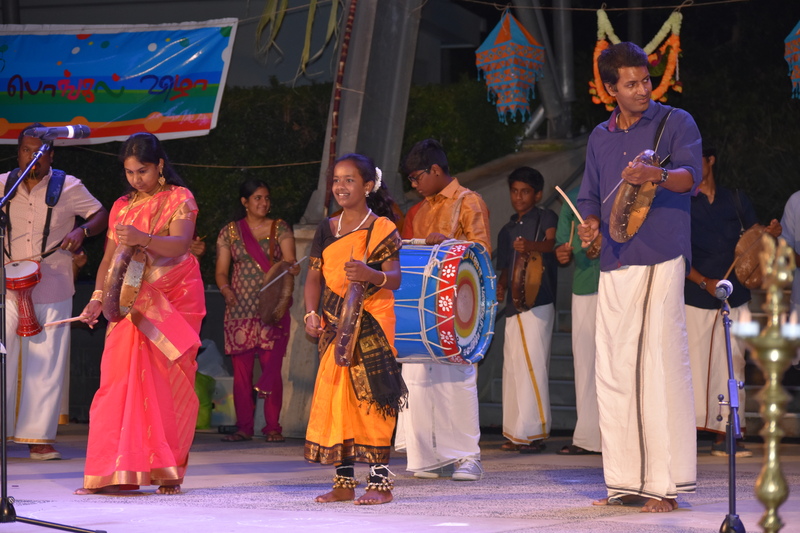 The Adelaide based Australian Tamil Arts troupe, along with locally trained Queensland Tamils started to beat the vigorous and rhythmic drums and commenced a dynamic procession in the ground. Their parade was studded with participants dressed as peacock, Bull and Lord Murugan, giving a unique atmosphere to the entire event and filled the park with the joy and music. The procession ended with a stage performance giving the audience an extraordinarily immersive experience. This was followed by two beautiful songs sung by singer Hari with his mesmering voice.He took the audience by storm, singing and dancing with his group of three. 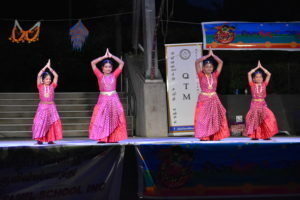 Mayooralaya dance school then staged a traditional Bharathanatiyam dance by four of its students. The great day ended with spectacular fireworks and gave an illusion of a three-dimensional colourful Kolam on the sky. 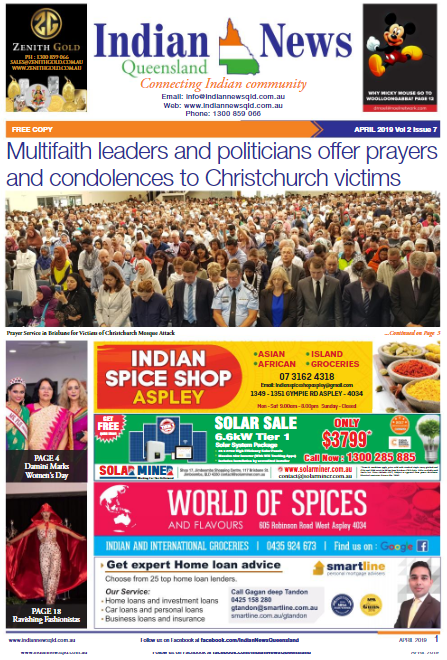 Diversity gives more depth to Queensland and such cultural events give us a chance to learn about other cultures and to promote unity and harmony in our sunshine state. Happy and proud to be living in this multicultural state.